This post was originally published on Entrepreneur.com. By some accounts, an epidemic of worker disengagement is raging in this country. In its most recent "State of the American Workplace" report, Gallup Research found that 70 percent of U.S. workers were either not engaged or were actively disengaged at work. While there's some debate over the validity of that assertion, we do know that creating an engaged workplace leads directly to higher profitability, increased customer ratings and reduced turnover. The question isn't whether we should be addressing employee engagement. The question is, "How?" Certainly, there is no shortage of software, consultants, wellness programs and other productized approaches to solving the problem. But, the reality is that some of the most effective ways to boost engagement are also the simplest and least expensive. 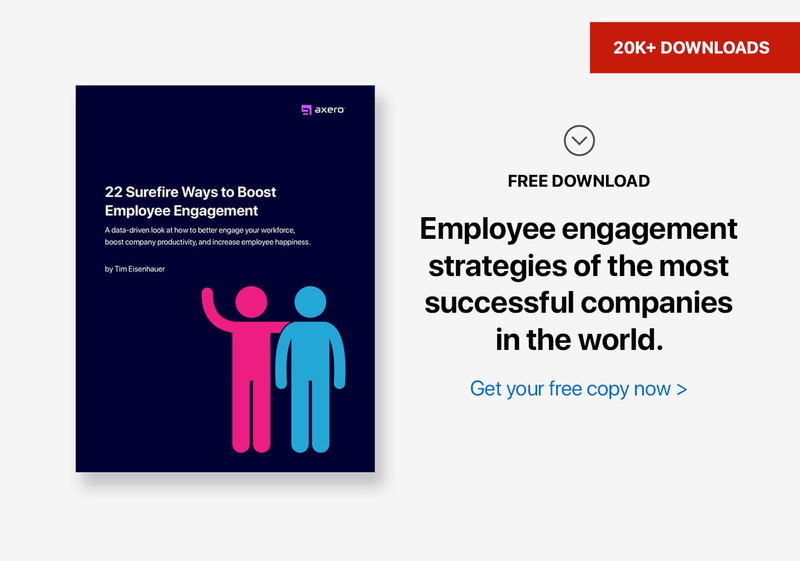 So, before your organization undertakes some months-long planning process or six-month software-deployment project designed to boost engagement, which will likely overwork and overwhelm your already stressed-out staff in the process, try these 10 simple but surefire ways to boost employee engagement -- starting right now. "Walking the walk" is the single most effective employee engagement strategy any company can deploy. Employees must see the leadership demonstrating the characteristics and behaviors everyone else is being asked to display. In companies where leaders model the desired behavior, employees are 55 percent more engaged, 53 percent more focused and more likely to stay at the company. Management transparency has a direct 94 percent correlation with employee happiness. Trusting employees with sensitive information gives them a sense of deeper investment in the company and helps to create a more cooperative team atmosphere, as opposed to an "us versus them" perception of the management-employee relationship. This should manifest in two ways. First, managers and the C-suite must be accessible and visible around the office, so that employees see them as approachable and available for guidance and assistance, rather than locked away in some protected area. Second, publicly recognize employees for their contributions and achievements. This not only motivates each of those individuals to continue doing great work, but also their peers. It's such a simple thing, but it's often overlooked, especially in large organizations. Acknowledgement by management and among peers is the quickest way to build trust, restore strained relationships and energize the workplace. Employees with supportive supervisors are 1.3 times more likely to stay with the company and are 67 percent more engaged. Companies are made up of people, not products, machines or property. Genuine relationships between employees and their supervisors and management inspires trust and builds comradery. In fact, a study by Blessings White found that managers who showed their human side were rated 59 points higher on critical skills among employees. Give employees the freedom to adjust their work schedules or location to better suit their needs. Many employers don't trust employees to get work done if they work from home or set their own hours, but statistically, workers with flexible hours and locations are more productive, happier and more engaged than 8-to-5 cubicle jockeys. 7. Hire traits and behaviors. Experience and education don't guarantee performance. Even the most skilled candidate will fail if he or she has a poor attitude. What's more, some people simply cannot be engaged. Emphasize hiring for and promoting the right behaviors and personality traits for your culture. Offer training in desired skills. 8. Engage from day one. Filling out mountains of paperwork and sitting through a canned PowerPoint presentation on the first day at work is a surefire way to kill engagement. New employees start with enthusiasm and curiosity, so capitalize on that momentum by putting them right to work, helping them to get to know their co-workers or pairing them with a mentor. Acclimate them to the culture by making an excellent first impression, and they'll fall in love with your company and their work. Doing good is good business. Companies that support philanthropic causes by involving employees and management in volunteer projects see a direct increase in engagement and productivity. Working together to help others demonstrates that the company isn't just about making money, but about making a difference in the world. Having fun together not only breaks up the routine but also encourages creativity and collaboration. Sponsor a company softball tournament or host a monthly "dress-up day," where employees can wear their ugliest sweater or sport a crazy hair color. Of course, management must also get in on the action, which further contributes to authenticity, visibility and communication. The "secret" to building employee engagement is that there is no secret. Want to know what types of things will help your employees feel more engaged? Ask them. You might be surprised by how simple the solution may be. Often, it comes down to the Golden Rule: Treat people as you'd want to be treated. And, save your money on those expensive consultants, programs and other productized approaches. Compassion, mutual respect, kindness and flexibility don't cost a thing.